Sometimes it is important that you see what we see in your mouth. Now ScopeAround can show you using an intra-oral camera. The camera displays full motion video and because it has a built in LED light source it gives us an easy way to see picture. you can get a full tour of your mouth and the ScopeAround FIT can zoom in on any cracks, cavities, or broken fillings. 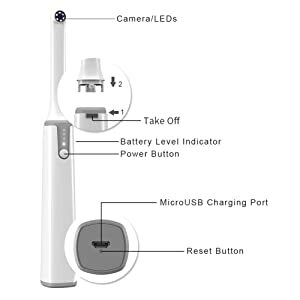 The intra-oral camera can let you see up close, your beautiful healthy tooth. The images you capture with the intra-oral camera are digital so they can easily be stored as part of your dental record. They can also be easily sent to specialists and insurance companies. Intra-oral cameras are a great new tool for dentistry.but this one your can operate by yourself.So you totally need it. ScopeAround microscope camera is strong,very lightweight, with Anti-glare and LED lighting technology, it display you the high quality image and vedio which over your imagine.,shortly usb full charging only need 3hours.The most important the camera easily share your fun with WIFI,why you do not need this one? With the ScopeAround side view camera head, the Fit, you can learn more about yourself. It was designed for dental intraoral inspection and cosmetic use. From checking for cavities to examining your pores you can find out what your body looks like up close, educate yourself, and take necessary action based on your findings. What device you can use it for? 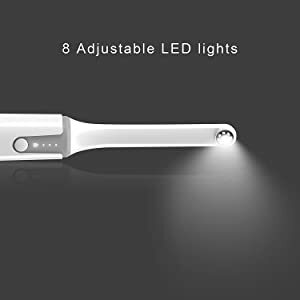 Attention:It looks like a toothbrush，actually it is the intraoral camera for you! How to Use?Put the camera head into the handle，take on the power button,then connect with your the ScopeAround APP. Search “ScopeAround” on Google Play Store or APP Store, or scan the QR code on the manual to download the APP. Connect your smart device with ScopeAround via Wi-Fi, open the APP and the live video will display on the screen. ScopeAround doesn’t let a little darkness stop your discovery. The camera is equipped with a LED light to ensure that you’re always able to get the image you need. You’ll be able to use your video camera day and night.